Lohri the traditional festival of Punjab, celebrated to mark the end of winter is associated with the harvest of Rabi crops. Anyone who has ever celebrated this festival dancing around a bonfire knows the spirit of this festival. Lohri is characterised by joy and colour. 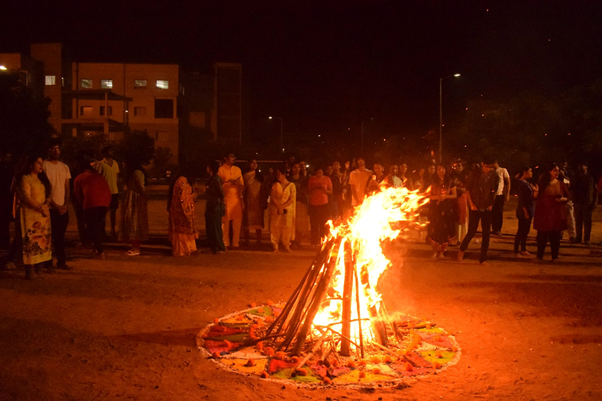 Similar to the spirit of Lohri, IFMR indulged itself to celebrate this colourful festival with utmost excitement and zeal. The ever-happening life at IFMR-GSB posed one more halt when the whole campus gathered in the football ground to contribute to the cheerful celebrations of this eve. The celebrations began with a traditional pooja where all the IFMRians dressed in traditional attires came close to pray for wellbeing. Soon the folk dance of Punjab started and everyone showed their best bhangra moves dazzling and dancing all over the place. The celebrations continued till around 12 midnight with groundnuts and gajak being distributed to everyone. Soon as the clock ticked away the tired crowd went back to their hostels after a night of joy and excitement.